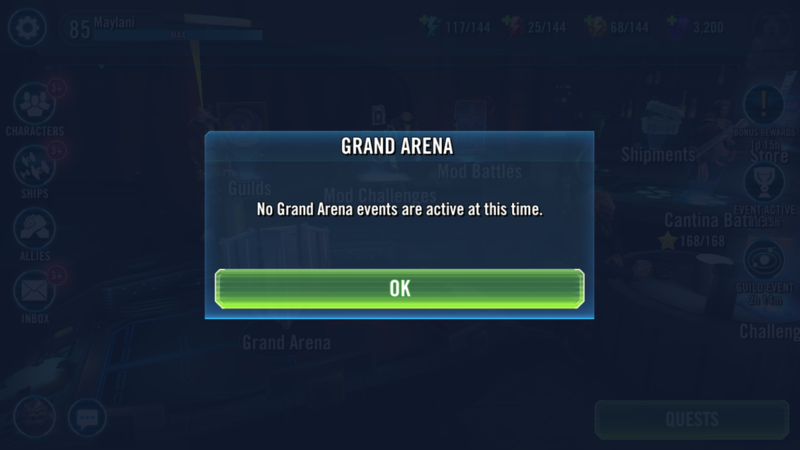 The option to join the 02/09/2019 Grand Arena never appeared for me. This has happened to several members is our guild in past Grand Arenas. I checked at least a minimum of 3x during the join phase. This is all I’ve seen the entire time. If you know it's active, hard shutdown your app and reenter. You didn’t click the JOIN button. If you know it's active because your guildmates are telling you it is, but you can't see it (even after force-closing), then you need to reach out to Customer Support at that time. Waiting until the day after - when signup is closed - means there's no way to get you into the GA.